Suitcases have been a travel staple for generations. They are compact, efficient, and stylish. This useful carry-all luggage is the home away from home for many globetrotters. It is useful and robust but, it doesn’t have to be expensive. 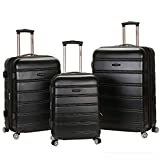 We have compiled a list of recommended cheap suitcases that will fit those who wish to travel on a budget. This is a list of cheap suitcases for people who travel once in a blue moon. They don’t need to splurge on a top of the line item, but it will still be stylish and useful when needed. The Rockland Melbourne 20-Inch is made of hard ABS plastic. It is lightweight and will last forever. It is equipped with a Chromed telescopic handle and a large assortment of colours. It is small enough to fit in most overhead compartments. Most airlines will allow this bag as a carry-on. There are inside pockets and compartments to organize your things. If you are thinking of getting this bag, check the interior colours. For example, the red one has a pink interior with white polka dots. The Kenneth Cole Reaction Out of Bounds is made of molded ABS plastic with corner guards. Fully lined interior and also lightweight. It’s also a carry-on designed to fit in most airline overhead bins. Feature packed including double pockets. Top and side handles for flexible carrying and handling. The out of bounds is made by a known brand but some sellers but some buyers complain about QC issues.  Keep Your Belongs Tidy:The interior features joinable elastic belt and an internal zipped divider (perfect for ties, underwear, socks and other knickknacks), to keep the contents in place during transit. The fully lined interior has organizational pockets to keep your belongs tidy. 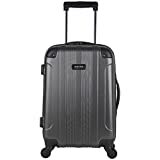  Multi-directional Wheels for Smooth Moving: The lightweight design in 20'' compact size makes the trolley case not be an extra burden while traveling, easy for your carrying. 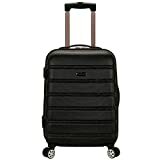 Also, four flexible 360° universal wheels make it easy for you to carry lots of heavycarry-on luggage.  To Be Comfortable & Safe: Sturdy ergonomic aluminum telescoping handle will not make you feel unpleasant, and a smooth corner will not hurt you when bump into the corner of the luggage.  Simple Style Design: Designed with simple style without fancy patterns, perfect for business trip, or meet requirements of those who like low-key style. Also, the waterproof ABS plastic surface is easy for cleanup, just need to wipe it off with a damp cloth. 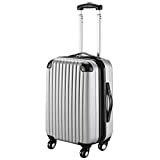  Sturdy Construction: Mainly crafted by lightweight, durable ABS hard shell and premium metal pull rod, our luggage features high hardness and toughness, scratch resistant and waterproof, sturdy enough to last long time without being damaged easily. There is a stigma with expandable bags. People would like to use it without going over airline carry-on limit. The Globalway 20″ is sturdy, waterproof, and scratch-resistant. It is very light it weighs in at only 6.6lbs. There are known quality control issues with the wheels for this model. So be sure to check yours before buying. Internal zippered divider w/shoe pockets and mesh zip pocket, with additional interior zip pocket and buckle tie-belt. The Olympia Apache is a 21 inch, fully expandable carry-on luggage. For a cheap suitcase, this one has a lot of features including a patented hidden compartment. The middle hidden compartment fits a full sized laptop. It is also a bit bigger than most carry-ons including the wheels. It measures 9 x 14.5 x 22.5. This exceeds the size limit of some airlines. The only polyester pick below $50. It is made of polyester nylon fabric. Heavy duty aluminum telescopic handle brings the weight up to 8.6lbs. It has a smooth fabric interior lining. The 21″ specification does not include the wheels. It measures 23″ to 24″ with the wheels and may be too big for some airlines. Equipped with a special TSA combination lock and resettable code. It is ABS plastic, comes in nine different color combinations. This is also a three-piece set. 21.7 x 14.2 x 8.3 inches for the carry-on bag. 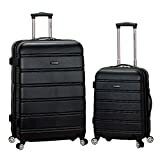 25.6 x 15.7 x 11.8 inches for the smaller luggage and 29.5 x 18.5 x 13.8 inches for the later bag. The manufacturer claims that it is expandable up to 15% of its original volume. This item almost no quality control issues and is expected to last for awhile. That is unexpected for a cheap suitcase under $100. Especially a large three-piece set. 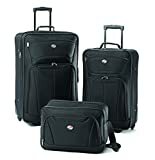 In other three-piece sets, the middle bag is the cabin carry-on. For the Haupstadtkoffer spree, The small bag is the cabin luggage. The Alex luggage is very similar to the one above just different aesthetic design. This design comes in 10 different colours including graphite and burgundy. It has the same TSA combination lock and anodized aluminium handle. The Cabin carry-on is small enough to fit in all airline overhead bins. Like all ABS plastic, it is prone to paint scratches especially while airport cargo personnel manhandles the luggage. This set, like other Hauptstadtkoffer sets there are very little quality control problems. Purchasing cheap suitcases is not a hit and miss game. First, know your needs. Check the cabin size regulations of your airline. Then, consider that size when selecting a carry-on, if you want to keep your bag in the overhead bin. Second inspect your item thoroughly. Cheap suitcases are cheap because it is mass produced. Quality control issues are expected. If you are particular about scratches and scuffs, consider getting a polyester/nylon bag. ABS plastic is just painted and is prone to scratches. Talk with your vendor regarding warranty. A lot of these items comes with at least 6 months warranty or return policy. Traveling on a budget does mean compromises, but it doesn’t mean accepting a defective item.